This is Part Three in a series about Chicago’s Experimental Film Coalition; and covers their annual experimental film festival. You can read Part One here and Part Two here. In addition to their monthly screenings, the Coalition founded what was initially called either the Festival of Experimental Film or the Experimental Film Festival. The first one was most likely in 1984. By 1987 it was called the Onion City Film Festival, which it has been called ever since. The Coalition ran Onion City annually until 2001 when it was taken over by Chicago Filmmakers, and continues to run to this day. Of the first Experimental Film Festival, the dates it ran and the exact list of films that screened are not known as of this writing. However, filmmaker Paul Glabicki lists that his film, Film-Wipe-Film won a Jury Award. For the second Experimental Film Festival, again the dates and films screened are not known. However, Coalition co-founder Sharon Couzin remarked that the fest ran for 12 hours a day for three days and only 35 people attended. Also, Glabicki writes that another film of his, Object Conversation, won a Jury Award at this edition. A little bit more is known about the third annual Experimental Film Festival in 1986. It was held in the loft of Richard “Hollywood” Roepnack and the judges were Barry Gerson and J. Leighton Pierce. Prize money totaling $1,500 was given out, but exact specifics of how it was awarded is unknown. What is known is that the first prize was shared by Carolyn McLuskie, whose film is unknown, and Rick Hancox, who screened Beach Events. In 1987, the festival was now known as the Onion City Film Festival, and ran on two days: October 30 and 31 at the Northwestern University Swift Auditorium. (The choice of location is interesting since the Coalition was started by students at the School of the Art Institute Chicago.) Both days featured three hour blocks of films. Also, somewhat confusingly, the numbering of the festivals begins to get mixed up a little by this change in name, as we’ll indicate as we discuss future editions. Additionally, animator Steven Vander Meer writes that his film Arcata Brain Closet was an official selection of the 1988 festival. In 1989, Rosenbaum remarked that the Onion City Film Festival was now in its 6th year, which is how one would count if one included the festival’s first 3 years. This edition of the festival was held at the Randolph Street Gallery, where the Coalition held its regular monthly screening series. The Festival Director was Laurie Dunphy; and the jurors were Trinh T. Minh-ha and Peter Thompson. 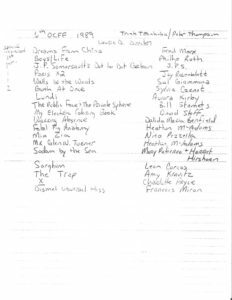 The Onion City online archive includes a PDF of a hand-written list of films that screened, which has been transcribed below. While the archive doesn’t include any reference to the hand-written list, it matches up with film critic Jonathan Rosenbaum’s review of the festival for the Chicago Reader. J.P. Somersault’s Dot to Dot Cartoon, dir. J.P.S. As of this writing, no information has been found for the next several editions of the festival, from 1990 to 1993. However, the Onion City Film Festival archive includes a PDF of the entire program for 1994, which ran on May 27-29 and is called the fest’s “8th Annual” edition. This means the numbering has changed by this time, eliminating the first three festivals from the official count. Festival judges were Lynne Sachs and Laurie Dunphy. (Dunphy was, of course, Onion City’s Festival Director in at least 1989.) The 1994 Festival Director is unknown, but Nina Puglia wrote the Festival Dedication to teacher and writer Marjorie Keller, wife of scholar P. Adams Sitney, who had suddenly passed away at the age of 43. Also notably, one of the awards was named the “Sharon Couzin Founder’s Award”. In our research, Couzin is never quite named as the official, singular Founder of the Experimental Film Coalition, even as her name is extremely prominent in the organization’s founding. Below is the list of films that screened, along with notations about the award winners. The final PDF of the Onion City Film Festival during the Coalition years is for 1996. Only two pages are provided and it is not known if this is a complete list of films that screened, as it seems like a much shorter list than 1995.